Somewhere, Goodluck, son of Jonathan, is laughing his head off, remembering a completely different kind of day when he was the president of Nigeria. That was the day that one Olusegun, the son of Obasanjo, penned an open letter to him, “Before It Is Too Late,” assaulting his presidency. But today is funny, Jonathan’s son reckons, because it tells you just how fickle Time is. Only a few days earlier, it was Muhammadu, son of Buhari, who was praising him as he reflected on that moment in 2015 when Jonathan conceded the presidential election. The date was January, in Abuja, as the son of Buhari hosted chieftains of his All Progressives Congress (APC), during which he recalled his ecstasy at winning the presidency, specifically the moment that President Jonathan called to offer his concession. “I went temporarily into a coma,” Buhari declared. Buhari’s comatose condition—his speechlessness, his frozen moments, his blanking out—must have lasted longer than he realised. Only Mr. Jonathan knows exactly how long. But this is how Buhari remembers it. “(Jonathan) asked if I heard him, and I said yes,” the incoming president said. In his idle moments, I am sure Jonathan’s mind has wandered back to that day, wondering if, had the tables been turned, Muhammadu would have conceded to him—a younger man, a southerner, a man with no military credentials—or if he would have huffed and puffed off to yet another election tribunal swearing dogs and baboons. But that was the past, which Muhammadu would dismiss as prologue as he took office, as if you can somehow phrase the past in the future tense or write someone else’s achievements into your biography. I am sure the feel-good hilarity made last weekend even better for the gathered APC bigwigs. 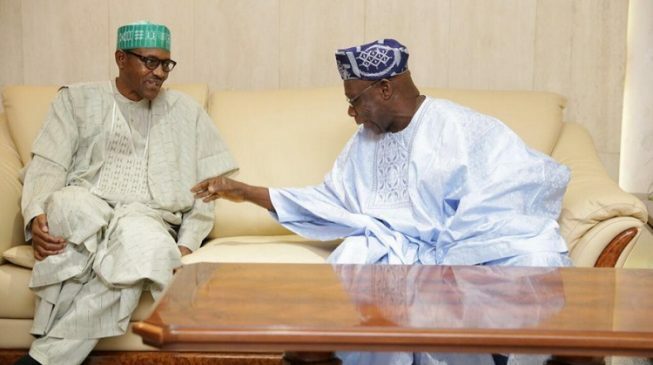 But then a new week arrived, and it was someone equally intriguing—Obasanjo—wiping it all away as he angrily dismissed Buhari as a failure and urged him not to pursue re-election. Which is why, somewhere this minute, the son of Jonathan, must be in the middle of another guffaw, remembering the similar inferno of an Obasanjo letter that inevitably led him to that painful concession call. And that while Buhari must have been smiling from ear to toenail at that time, Jonathan knows he must be burning with rage right now. Elsewhere, Jonathan has identified this menace as “the boss of all bosses” imperative. That was last November, when he assessed former Vice-President Atiku Abubakar’s 2019 presidential hopes. Obasanjo, it is widely-known, cannot stand Atiku, with whom he wrestled in the mud even when they occupied the country’s highest offices, and whom he treated with contempt and savagery in his last book. But last week belonged to Buhari, in terms of Obasanjo’s dismantling of his mystique, pretences and prospects. The import of this is that between his hatred of Atiku and his dismissal of Buhari, Obasanjo not only declared the presidency vacant, he installed himself kingmaker. The reality is that Obasanjo is an egomaniacal hypocrite. In 1999, he had the best chance of a Nigerian leader to make the changes he now seeks, blew it, and then tried to buy an illegal term. As a result, he lacks as much moral authority to his sabre-rattling arrogance as to the meaningless PhD he claimed at the weekend, the funds for which would have lit the highway for a bright 25-something old Nigerian whose work would have meant something. Beyond that, the question Obasanjo raises is that Buhari is incapable of the office he holds and can rise no higher than he has, if he has. In 2015, Nigeria made a mistake, but it was the right mistake to make given that a prostrate Jonathan was his principal rival. It is now clear that even if he spends 20 years in Abuja, he will not summon the character, or capacity. He was a grossly-overrated advertising copy, including by me, in a situation where the PDP record up, including Jonathan, blinded so many of us to Buhari’s emptiness of content. So badly exposed is he that the defence of Obasanjo’s charges by Information Minister Lai Mohammed studiously avoided the most significant charges, which relate to Buhari’s character, vision, personality, grasp of leadership, command and control, and willingness to accept responsibility. Mr. Mohammed did not answer it. Buhari came into office bragging about the carnage he would inflict upon the corruption conglomerate, but has done very little, and has disobeyed court orders to publish loot recovery records since 1999. Furthermore, almost everyone in his administration who has faced corruption allegations has received the full protection of the presidency. The weakest of ministers remains in office. No scandal is so outrageous it is not ignored. The past may be prologue, but the present has become a joke, and change has been shortchanged. To top it all, Buhari then confesses he lacks a sense of urgency. He is in no hurry to do anything. Perhaps not. After all, the state takes care of him. Should he fall sick, he goes to London, and should his child fall off a tree or off a motor bike, he is guaranteed the best medical care Nigeria can buy. Two things are wrong. First, he failed to add “the able.” And then, he wrote in himself as a participant. Worse still, it has emerged he will personally champion that coalition. But Obasanjo is a key alchemist in a modern Nigeria laboratory for which the ex-military hegemony of himself, Ibrahim Babangida, Sani Abacha and Buhari, are principally responsible. Perhaps Buhari should “dismount the horse,” but that alone will not advance Nigeria, unless others key figures riding their high horses of arrogance, complicity, duplicity and double standards, also dismount, and surrender their weapons. A third force? Absolutely. But it is dead on arrival if it is manufactured by the one and manipulated by the other, or both.